I love taking public transit during my sushi adventures, except when I am in a hurry. For some odd reason, whenever I am in a rush, I end up missing each of my connections by a minute or two. Such was the case when I tried to go to Yohachi Sushi (in North Vancouver), which features decent sushi and a beautiful body of water to the south. I missed the 1:31 p.m. SeaBus sailing by just two minutes and could not make it in time for lunch! Clearly, the force is not with me. 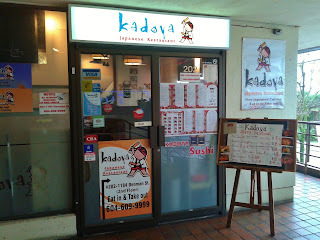 Not wanting to forgo my beautiful body of water to the south, I decided to head over to Kadoya Japanese Restaurant. Kadoya Japanese Restaurant has two locations in West End, and after a few minutes of wandering around trying to find either one of them, I ended up at their second-floor location near the south end of Denman St. The interior decor is Japanese-themed, but the restaurant is Korean-operated and has a bit of a funky touch to it. When I tried to flip through the menu, I was startled by how dirty the menus looked, but upon closer inspection, I realized that some of the random specks were actually part of the design. The menus were either an epic design fail or "modern art." I know, it's hard to distinguish the two. During my search for fancy nigiri on the menu, my heart found its true love when my eyes met with the $3 nigiri flowers at the end of the list. The Kadoya Flower came with scallop, avocado, and two pieces of tuna surrounding some sushi rice. The fresh taste and melty texture of the tuna went perfectly with the light sweetness of the scallop. The Davie Flower consisted of scallop, ikura, two pieces of salmon, and sushi rice. 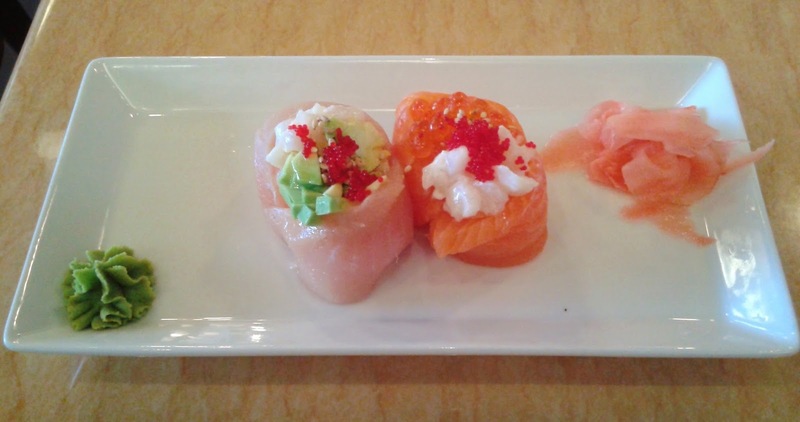 The juicy ikura provided some extra depth of flavour to the buttery, creamy flavour of the salmon. The only issue with the nigiri flowers was that due to their size, they were hard to pick up and impossible to eat in one bite (unless you are part pelican). Wanting to experience what it would feel like to be a king, I decided to order the King's Roll, which consisted of prawn tempura, wild salmon, green onion, garlic, honey mustard, avocado, and cucumber. My plan sort of failed because I could not imagine any king eating sushi with honey mustard and garlic in it. I must say that this roll is filled with funkiness and will only appeal to those who are fans of both honey mustard and garlic. I liked the crunchiness of the garlic crumbs, but I found the tempura batter on the prawns a bit thick. The wild salmon had a nice smooth texture but was sort of drowned out by the small dabs of honey mustard on top. Wanting to end my meal with something that tasted more normal, I decided to go for the Chicken Teriyaki with Fried Rice. I chose the fried rice version over the regular steamed rice version because it was cheaper for some reason. The fried rice was delectable and infused with tiny bits of egg and some sesame seeds. The chicken was mostly tender, and the chicken skin was mostly crispy. However, there was this one unfortunate piece of chicken that was full of tendons and came with a smooth, rubbery layer of skin on top. Oops! 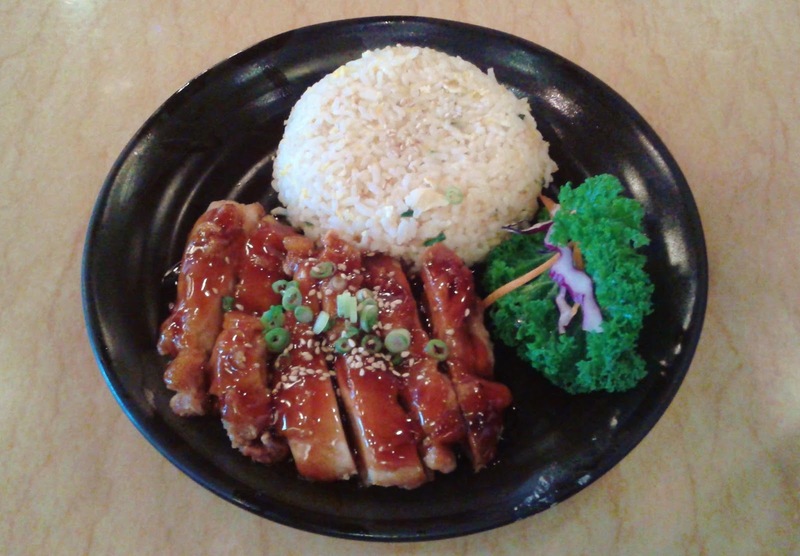 The service was decent and the prices were reasonable for the quality of food. The portion sizes tend not to be very big, but fortunately, the fillers are not expensive. I would not consider this restaurant a must-try, but it does the job fairly well for a modest price. Furthermore, it is quite close to a beautiful body of water, if that helps.